Several applications in the market claim to offer the best service for tracking/tracing a lost or stolen mobile phone. However, most of them come with some or the other drawback and end up being unsuccessful in tracing the device. However, Mobile phone owners still use these third-party services to track their lost/stolen mobile phones. As those third party services seem to be unsatisfactory, Apple has come up with a new application to track/ trace stolen or lost iPhones. 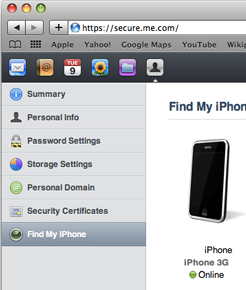 This service which is known as “Find My iPhone” efficiently locates a lost iPhone remotely via iPhone’s GPS feature. iPhone users can avail this service as a part of “MobileMe “, an online subscription service by Apple. In case your iPhone gets lost or stolen, you can easily track the location using Google Maps and send a SMS on your iPhone which will appear on its screen even if it is locked. You can also make your iPhone play a sound for 2 minutes. All this can be done remotely. The SMS and the sound can work as an alert for the culprit to return the device back to its owner. After you find out the location of your stolen iPhone using Google maps, the sound that you play can help you in tracing the thief within that area. Apple offers this MobileMe service with a free two months trial after which you need to subscribe by paying $99. However, you can get this service at Amazon.com store for just $71.99.